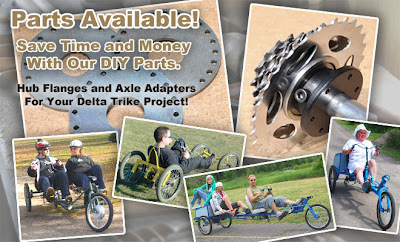 Delta Trike Axle Adapters – Freewheel Adapter (left) and Disc Brake Adapter (right). Our laser cut Hub Flange Discs will make it easier for you to build your own delta trike wheels and save you time on your project. This Hub Flange Disc is made with 24 spoke holes so that you can build wheels directly onto any 3/4″ axle using rims with 48 spokes. The Hub Flange Discs are made of steel and are approximately 1/8 inch thick as required by the plans. Spoke holes are 7/64″ in diameter so that standard bicycles spokes can be used. A quadcycle or “quad” is a four wheeled bike with two front steering wheels and one or more rear drive wheels. The obvious advantage of such a vehicle is stability, since it has four points on the road at all times. My initial idea was to start with a quadcycle like our StreetFighter and just bring up the seat height and overall track width a little more for visibility and stability. I had a lot of fun carving up the corners in the StreetFighter, and knew that it to be a very robust and stable vehicle for just about any kind of riding and terrain. 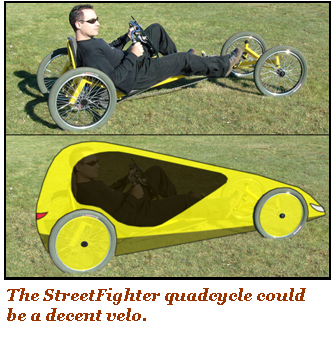 But, after giving more consideration of the goals for this project, it became apparent that there would be no real advantage to having two wheels at the front and a quad configuration would make using an electric assist hub motor impossible. So, the quadcycle idea was abandoned in favor of a trike, which now left only two choices: delta or tadpole configuration. A tadpole style trike places the two steering wheels in front beside the pilot and places the single drive wheel at the rear behind the pilot. This type of trike offers great handling and allows for the use of mostly standard bicycle components in the rear end and transmission system. 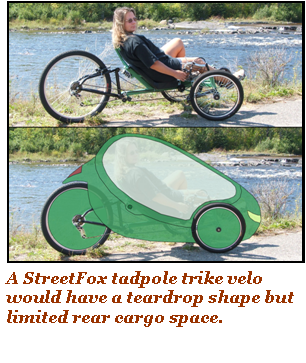 As for aerodynamics, a tadpole trike is better than a delta trike because a teardrop body shape can be used, which places the tapered end at the rear of the vehicle for optimal travel through the air. Another nice thing about the tadpole trike configuration is that a full fairing looks nice as it wraps around the pilot, leaving the large end in the front with plenty of room to install a full view windshield. Most of these advantages are more aligned to a vehicle designed for looks and speed, and not so much to a practical velomobile designed for everyday use and cargo carrying. A teardrop shape leaves almost no room in the rear for a cargo area, and although rear hub motors area available, they are less common and more expensive. This leaves only one other configuration to examine, the delta trike. A DeltaWolf trike velo is the best design for cargo carrying. A delta style trike placed one or more drive wheels behind the pilot and has a single front steering wheel ahead of the pilot. This type of trike offers stable handling using standard bicycle components in the steering system and a great deal of cargo carrying ability. Having the wider end placed at the rear of the vehicle means that a delta configuration is less aerodynamic than a tadpole configuration, but this is hardly noticeable at the typical riding speeds that will be seen in city traffic. For a racing vehicle designed for optimal speed, this teardrop shape is the ultimate design factor, but for a utility vehicle, it will be of little concern. The load bearing wheels and drive system at the rear where the pilot sits are a great advantage of the delta configuration because it will offer the most traction and braking possible as well as keeping the load centered between two wheels. Since there is nothing except for the single front wheel and pilot’s feet at the front of the vehicle, the body shape can taper towards the front and keep the total volume much lower than that of a quadcycle configuration. A delta trike is also the most robust of the three possible configurations because it uses standard bicycle components in the steering system with axles and industrial grade bearings in the rear. Having a standard set of bicycle forks in the front means that a commonly available electric hub motor kit can be easily installed to offer an electric assist drive. So, it became obvious that a delta trike would offer the best base vehicle to use for a practical velomobile with load carrying capacity and an electric assist dive. Making the final decision on the base vehicle meant that I could now come up with my wish list of other features I wanted to have in my practical velomobile, which would include rear suspension, dual disc brakes, a suspended cargo bay, over-seat steering, long range electric drive, a trailer hitch, a head light, turn signals, rear view mirrors, and of course a full body with easy access when getting in or out. All of these features would be easy to integrate into a delta trike design. 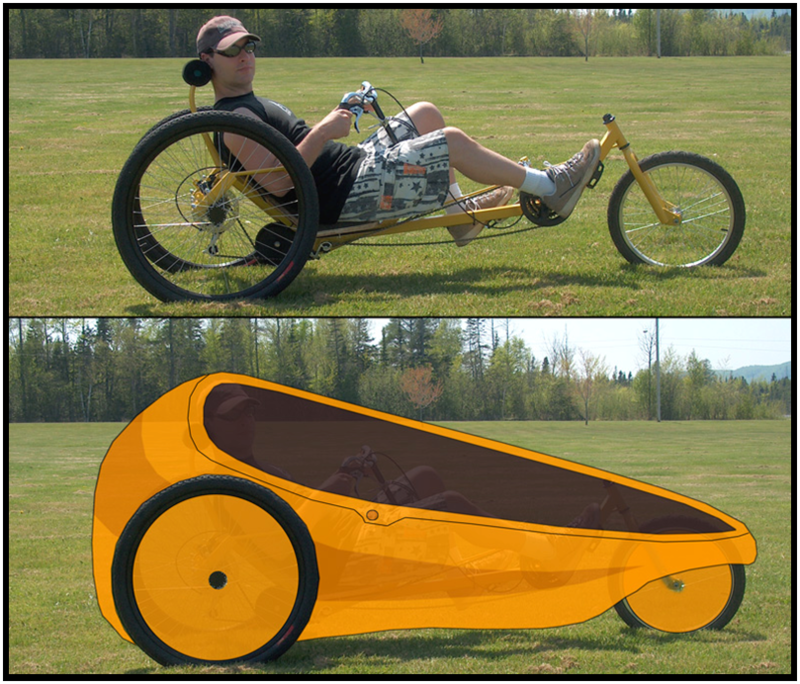 Since winter has now set in around here and I normally work outdoors, I plan to build myself a velomobile in what would be considered reverse order – making the body first and then building the base trike to fit into the body. Typically, I’d build a body over a trike, but since I have to work indoors for the next six months and I already have a trike to use as a reference (my Aurora Delta Trike), I feel confident that this order of operations will turn out fine. The Aurora trike already has most of the features I want such as rear suspension and dual disc brakes. I only need to decide on a seat height and track width to use in the final design. For my practical velomobile, I want a slightly higher seat height (similar to a car) for optimal visibility in traffic as well as a slightly wider track width for cornering stability and increased cargo capacity. Other than those changes, the Aurora trike is a good fit with its rear suspension, a recumbent seating position, and a robust transmission system. I’m able to remove the rear suspension spring and simply prop up the rear of the trike to the height I want, so now I have a base vehicle that can be used to take measurements and work out the size and shape of the body. Using a few photos taken from the side, I can make several mock-ups in Photoshop to help me decide on a general shape of the body. With a base vehicle to take measurements from and a clear set of design goals, I can concentrate on the side profile of the body, which will involve some practical thinking as well as artistic abilities. The final design will become a combination of both aesthetics and ergonomics, allowing the rider to get in and out of the vehicle easily, while maintaining a sleek modern look with pleasing curves and proportions. Some of the other factors that will influence the final design will be the type and strength of the materials used, plus costs and complexity. Once I decide on a final body shape, it will then be a matter of choosing the best possible materials to build a lightweight and robust body for my practical velomobile. For the next installment of this build blog, I’ll have a decision on a final body shape as well as the materials that will be used to create it. This project also needs an official name, but we intend to let our community choose one in the near future, so please visit our forum and offer your moniker for our practical velomobile project. Every time I find myself standing at the gas pump, holding down the lever while the dollars spin past, I tell myself that there must be a better way. Let’s face it, the cost of using a gas guzzler adds up to a lot more than just a dent in your wallet each time you fill ’er up, although the pain you feel at the pump is certainly instant. How about all of the effects to the environment? Using a gas powered vehicle to pick something up from the store a few blocks away is certainly convenient, especially on a cold day when you can just press a button on your car remote starter and let the interior heat up for you. But, with millions of people doing this, what is the net cost on the environment? Call me paranoid, but with the crazy worldwide weather we have been experiencing in recent years, I think the answer is obvious. From this point forward, I will use the word “car” to refer to all gas guzzling ground transportation vehicles. Environmental issues aside, there are many good personal reasons to be leaving the gas guzzler parked more often. My health has been impacted by the convenience of the car since the first day I passed my road test. How did I all get around in the days before becoming enslaved to my car? Well, besides begging for an occasional ride, I got around on foot or by bike! I remember how simple things were back then. My main concerns were usually how long it would take to get from point A to B and making sure that my tires had air. I had no expensive repairs, no insurance costs, no parking problems, and didn’t have to work overtime just to pay for fuel. Ironically, I had more free time even though it took a lot longer by bike because I didn’t have to schedule in time for exercise because it came with the lifestyle! That extra body weight was a direct result of using a car, too. Sure, the car helps me get around in a hurry, but I end up either wasting more time and money to sweat over a treadmill or consulting with a doctor on how to fix my health. Seems as though in our later years we have things backwards, don’t you think? “DING!”Oh, hold on a minute, the truck is filled now. I have to go give the attendant another $70 bucks! I’ve decided to get a grip on my shrinking wallet and ever expanding waistline, and find a practical way to leave the car at home as much as possible. Now, the key word here is “practical”. Living in the a rural area of Northern Ontario means that I will always need a reliable car or truck to move large cargo and to travel large distances to the city in the winter, but since there are some local stores within riding distance a bike could certainly be used for many journeys. 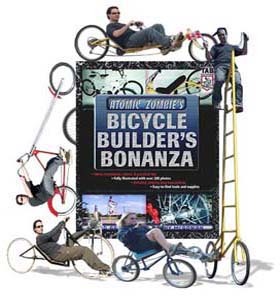 For those who live in the city, a practical human powered vehicle with some cargo capacity could also be used for many local trips, such as grocery runs or social calls. For me, practical also means affordable and robust, which almost always translates to home built, which to us DIY types is great news. 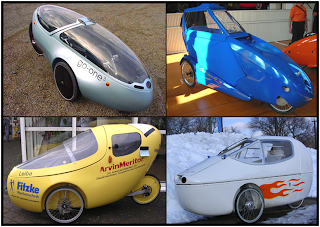 Of course, there are commercially available human powered vehicles “velomobiles” for those who can afford them, but since they tend to be as costly as a decent used car, they are out of reach for most. 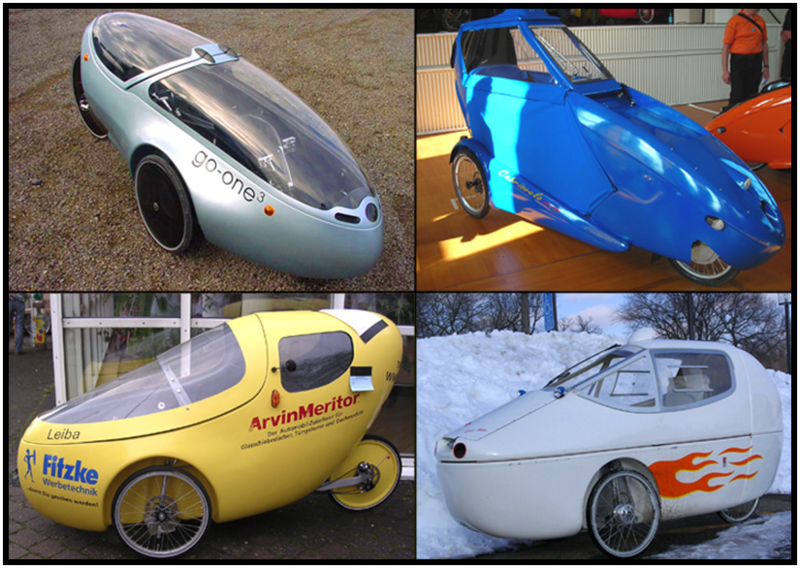 All of these velomobiles pictured above are obvious works of art, but there is no way I would ever part with ten grand for something that I could build myself. 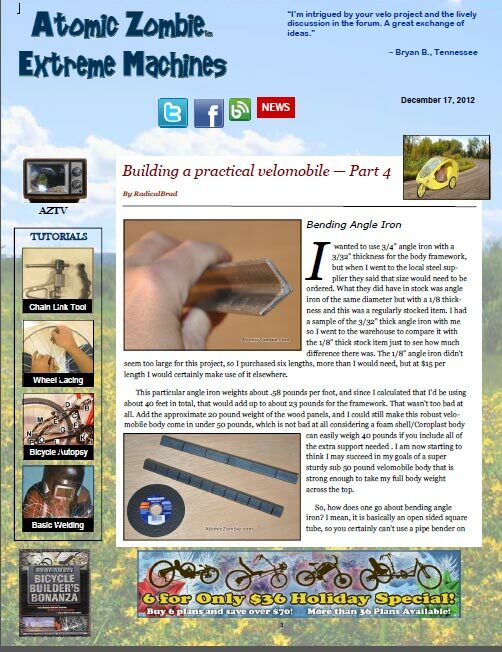 Obviously, there will be tradeoffs between cost and aesthetics, but there is no reason why a very practical and sturdy velomobile could not be built using readily available parts by anyone with a few basic tools and a lot of motivation. 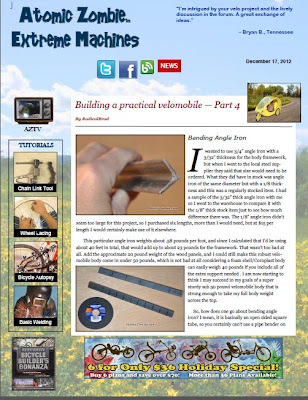 In fact, I have seen some home built velos that are streamlined works of art, but often the cost of materials used and the skill set needed are beyond most of use weekend garage hackers, and the end product is more like a hotrod than a bike you would want to take out in traffic or ride around in the rain. My goal is to build a body using basic materials that is both aesthetically pleasing yet at the same time tough enough to live in the real world. Living in the real world means taking Mother Nature’s wrath of rain, sleet, hail, wind, and constant bombardment of UV radiation. Living in the real world means surviving the odd ding, dent, or scratch from crowded urban environments, being able to bounce over a curb and take the abuse of a poorly maintained road without shaking to pieces. Living in the real world also means living in the urban jungle, so the vehicle will need to be visible in traffic and include the usual safety gear such as rear view mirrors, brake lights, head lights, turn signals and a horn. Living in the real world means offering the pilot some shelter from the elements without requiring any acrobatic maneuvers to climb in and out of the vehicle. And of course, living in the real world means that the vehicle must include some practical cargo carrying capacity for such things as groceries, a battery pack, and personal items. So with all of these goals in mind, the first choice becomes – delta, tadpole or quad? The type of base vehicle will determine the overall shape of the body as well as its load carrying capabilities, handling characteristics and aerodynamic advantages. Choosing one of the three configurations was actually quite a chore as they all offered advantages and disadvantages when it came to costs, aesthetics, practicality, and ease of building. In the end, I decided that a delta trike would be the most practical base vehicle, but I will discuss all three possibilities, as well as their strengths and weaknesses.